My daughter just got the Break Up Oil and she was wondering if she can use it on both parties that she wants to break up and what the best methond of personal contact is the best? I am curious also. She would like to use it on them personally so any suggestions would be appreciate it. We were also curious if anyone has had success with this oil and how long it took to become effective. I think with any work you, your offspring or anyone-else might take on and the results expected, it depends on and is greatly effected by your level of focus, your real intent, your manifesting the results you want. this, combined with the proper "ingredients" and "working" knowledge you can and will have success. have used LMCC brand Break Up oil with prompt success, your results and time may vary. Thanks so much. She has personal contact with them so I hope it will work for her. But I will definately let her know about the door knobs, pens, phones, etc. How dose the oil work, I mean do you have to back it up with a spell or candle ? Sammy ,you mentioned lemons,do you have a good lemon spell ? My long time lover (15 yrs) took up with a much older woman with money.He has been a father to my disabled daughter since she was four,then for the first time in fifteen years he stood her up on her birthday.We called but he turned off his cell phone. Days latter he made up some lie about not feeling well. He latter confessed to being with her ,that she knew he had plans for Shannons Birthday and she demanded he stay with her. She is buying him jewley and furnture and took him on a cruise to Italy and Greece.....He told me he was on a trip to visit his sick mother! I then found an email from the woman demanding stop seeing Shannon.....I was so shocked ,I feel like the rug was pull out from under me. Can anyone give me some advice ? Thank You. do a search for lemon spell- it has been discussed on the forum before. You might also look into the break up kit. Oh and I love your name. I have a design bussiness I am starting called "Flying Monkeys". After all ,couldnt we all use some flying monkeys from time to time ? I just asked my first question here and I was happy with the prompt reply. I'd like to ask another question: what color candle should I annoint with break up oil? Thank you. Do you want to break up two people? Get black figural candles that represent the genders of the people you want to break up and dress those candles with the Break Up Oil. I read a Break Up or Separation spell and am trying to find it again to see if there's any part I'm forgetting. From what I remember, you take a black candle and carve the two names, one on either side. Anoint it with Break Up Oil and herbs and burn the candle. The spell you describe is one version of a well-known family of spells. It is complete as you give it. In another version, you wait until the candle has burned low and then you split it with an axe, as (while it is burning) as if it were a stick of wood. Not at all. It is a strong peppery, icky, I can't even explain it smell. It doesn't smell that pleasant. It is more for getting the people you're trying to break up, in contact with it and for dressing break up candles. Ribena: I suggest you get some of the Break Up Oil and some of the Inflammatory Confusion Oil and mix them up yourself. Then take a sniff. Would you use this in your hair every morning? What is your current relationship with this young woman? Ribena, Break Up and Infammatory Confusion have a pretty "hot" smell that is not real perfumey. You can try your plan, but in order to make it smell better, i would add a little Look Me Over oil as well, so she takes a look at you too. I ordered some Break Up Oil and Inflammatory Confusion Oil to add to a vinegar jar already in progress. Are there any other practical ways to use these oils? I have to be discreet, so figural candles are not an option. Thank you in advance for your suggestions. You can anoint desk surfaces, doorknobs or the shoes of your targets with the oils. Dab a bit on a discreet area of their clothing (neckbands and hatbands are great for this). Anything that will get them to touch the oïl. Do make sure you call them into the work as you deploy it. Thank you for your expedient reply, Miss Aura! You can order break oil right here! My target is moving in with his new tart after only seeing her for a month... A relationship like that is doomed too failure anyway, but I was thinking of putting some break up oil on the furniture he's coming to collect from my place to take to hers. Both will have contact with it. Will it cause my target to want to break all contact with me, as well, though? I have also sprinkled some Return to Me satchet powder into his coat pockets, and was debating doing it on the furniture as well... I feel like it's not a good idea to mix them, but I just wanted to clarify. And no, it won't affect his relationship with you as long as you state your intentions clearly. 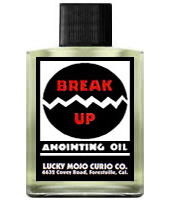 I have the break up oil. I don't have the black figure candles. Can I just use black candle? that's not figure? And just carve his name and my name dress candle light say what spell is for? So I've been readin all day about break up oil and figure movement. I think my boyfriend is cheating on me with someone he works with. He's admitted to date her before we meet but some doesn't feel right about their close relationship anymore. I want her out of his life and I'm wondering it I can do a break up spell on the two of then using figure candles to move then apart. And move her closer to her husband and him closer to me. I don't have any items from her or her husband but I do have photos of them. Will break up spell work on friendship as well? Like I don't want them to remain friends or continue working together. Though I do prefer personal concerns such as hair for doll babies and other kinds of spells, I have found photos to be very effective for candle work. You'll see that while the cheating husband/boyfriend is moving back toward you, the Other Woman is moving toward a little bowl of ... Attraction, Love Herbs, or some other nice thing. You could easily replace those herbs with another male candle named for her husband. Anoint it well with Peaceful Home and Reconciliation or Love Me. Here’s the question: Are these 3 Oils safe to burn on candles indoors, especially with the windows closed? I know that some spiritual supplies are not safe to burn indoors, such as some incense products. I don’t usually have windows open during candle work because wind and drafts can blow out the candles. And I understand that Hot Foot is usually deployed in powder form, but ConjureMan Ali did suggest using Hot Foot Oil for a candle spell at this link: spells-to-destroy-affair-or-marriage-so ... tml#p25123. So, I guess Hot Foot Oil is sometimes burned on candles. Thank you for your reply, sisterjean. Yes, after using spiritual supplies of this spiritual nature (enemy work and such), I always cleanse myself with cleansing spiritual supplies (Hyssop, Uncrossing, etc). Here, my main concern is regarding any physical danger, such as if any of these oils are dangerous to burn indoors. I know some Lucky Mojo incense can not be burned indoors, but I didn't know if any of the oils are not safe to burn indoors. "...two of the formulas -- specifically used to do "tricks" or evil work -- contain ingredients which should not be inhaled. Hot Foot Incense, which contains capsicum and sulphur, and Crossing Incense, which also contains sulphur, MUST be burned outdoors. " Since Hot Foot is mentioned, I did not know if this is also true of the Hot Foot oil. I also wanted to check to make sure that the other 2 oils (Break-Up and Inflammatory Confusion) are also safe to burn on candles indoors. Your question is a good one, but please note that this is a thread about Break Up Oil, not the other two oils you are interested in. We keep each thread dedicated to one type of spiritual supply because we have almost 5,000 productsin our complete inventory. Break Up Oil has been used to dress candles for decades. It is not burned in a cauldron, like a fuel oil. You can order righthere in the forum by clicking the blue "Add To Cart" button. Can I put break up oil in some of the target hair supplies and body wash??? I know I can rub some on her door handle, but is there a series of days I need to do that? And last question do both of the people I'm trying to break up need to come in contact with the oil?? Yes you can do that, but make sure to use small amounts so the oil isn't detected (especially on the door handle). I can't tell you exactly how many days you'd need to do that, it's really until you see the results you want. And yes, I think your work (if you're doing it this way) would have a better chance of success if both parties come in contact with the oil. But if that isn't possible, you can always make a Break Up jar or do Break Up candle work. Im working a vinegar jar for my ex. We see each other quite frequently during the week to hand off our child. I am meeting him tonight. Usually he goes in the store across the street to grab a bottle of water, while I wait with the baby in the car. During this time, is there anywhere in his car I can rub the break up oil. Whag about if I put a few drops in hi gym sneakers he keeps in the trunk? Or what about a dab on the handle of the car doo since I know he will touch it. You are thinking in the right direction! Put the oil on whatever it is you think he will touch but you will want to be careful not to be to obvious with it as you will not want him to notice what you have done. If you have time getting some in his shoes is an excellent idea! It wasnt obvious at all, he has no idea. i have ordered some break up oil, can I use it on my ex to break up with his gf?? if I put some oil on his clothing or on his necklace or shoes?? Yes, you can use Break Up oil for that purpose, but I wouldn't put any on his clothes because the oil will leave an obvious stain, and I'd only use the oil on his shoes if you put it on a spot that won't stain (like the sole). You could also put a few drops in his shampoo or body wash (don't overdo it) and a dab on his doorknob if it's a very small amount, or his door handle. thank you, what about a small drop on his phone or car keys?? After performing a "Bad spell" do I need to rid my home of all oils, matches, powders, etc., used to dress the jar and candle out of my home as well or can I keep them? After performing a negative spell, you can keep the supplies. 2. You can make sure that the room you're working in has good ventilation. If it doesn't, you may just have to work outside after your neighbors have gone to bed. 3. I wouldn't recommend changing anything about the spell. It's written that way for a reason. That's why the Break Up kit includes a packet of hyssop herb, so you can spiritually cleanse yourself afterward for the heavy work you've done. Personally, I don't use Goofer Dust in my break up jars. You cold build a "makeshift" graveyard and use that dirt. Thanks miss Aida! :) also is it ok to bathe in hyssop before performing my break up spell as well as after? Thanks! My break up oil has arrived (yay!). As soon as I opened it I noticed the smell of camphor in it, but I always thought camphor was for purification. Am I right in thinking there is camphor in the oil? We do not disclose the particular formulations of Lucky Mojo products, so we can't answer your question. You can rest assured that the Break Up oil has been crafted accordingly and is a very good addition to your work. You can trust it. I have a question...I have break up oil coming in the mail, and already have inflammatory confusion oil. I was wondering if I'm their own in a homemade candle I could use them and mask the scent with something artificial. I also have powders of both formulas. I'd like to make a black candle as a "Halloween gift" to a couple that lives together I want to break up. So also, would the candle itself work as a breakup spell whether or not they used it? The only thing that I recommend to mask the scent is Lemon. That would be it. Yes, it would still work even if it's not lit. It's a sneaky trick. And a clever one at that!! HELL YES! HAHA Thank you! I'm pretty sure that I never felt as clever as I have this past two weeks plotting heavy breakup work that I'm nearly ready to start!